A raw milk cheese assortment: Abondance from the French Alps , Asiago d’Allevo from Northeastern Italy, and Sao Jorge from Portugal’s Azores. From iGourmet.com. Click here for more information or to purchase. The Great Raw Milk Cheese Debate: Are Raw Milk Cheeses Safe? Welcome to Whey to Go! for April 2007. Every month, we’ll delve into a new cheese-related subject. If you know anything about cheese, you understand that raw milk cheese is one of the perpetual hot-button topics in the cheese world. Raw milk cheeses are, of course, cheeses made from milk that is unpasteurized, and the debate over whether or not they are harmful—or even whether they should be permitted to be made and sold—has continued unabated in the U.S. for years now. Americans are a people frightened of bacteria. If you think I’m overstating this, watch television. See how many ads you’ll find for antibacterial soaps or disinfecting cleansers or hand sanitizers. Advertisers and manufacturers bombard us with claims that their products are “pure.” This attitude seems lacking in many other developed nations. In the fall of 2004, I attended a specialty food expo in Turin, Italy. For a few days, I helped in the only booth from the U.S. We were cutting and sampling cheeses from small-scale cheesemakers. When I was asked to cut up more cheese, as we were running low on samples, I started looking for plastic gloves. One of the booth organizers laughed. We had such gloves, she said, but it wasn’t a good idea to wear them. When I asked why not, she told me that she had worked this booth at the same food expo two years earlier, the first time Americans had had a booth at this show. Anxious to do things right, of course the Americans wore gloves whenever they handled any cheeses, and were promptly laughed at by the multitude of Italians in attendance for taking such absurd, unnecessary precautions. So, at least in 2004, none of us wore gloves when handling our cheeses, nor did any other food handlers I saw at the expo. I ate raw milk cheeses for five days. I consumed a raw veal sausage there. Even Prince Charles (yes, that Prince Charles) was at the expo; I myself saw him sampling a few Italian foods. And nobody died. Over time, I’ve met a number of individuals who make their cheeses from raw milk. Within the U.S., at least, cheesemakers who use unpasteurized milk invariably have smaller-scale operations, and they are fiercely passionate and protective about what they do. These cheesemakers insist that their cheeses are at least as safe as those made from pasteurized milk; they also believe that there’s a range and complexity of flavors available in cheeses made from raw milk that can’t be replicated in their pasteurized milk counterparts. Some even suggest that large-scale cheese manufacturers are the ones pushing hardest to stop the sale and importation of raw milk cheeses altogether, because they realize they can’t get the same great flavors into their factory-made, pasteurized milk cheeses and don’t want the competition. Yet there are segments of the population in this country, including food professionals and scientists, who are convinced that consumption of raw milk cheeses is simply asking for trouble. They point to the possibility of contamination by pathogens that do not treat the human system kindly, including old standbys such as Listeria monocytogenes, E. coli, Salmonella, or Campylobacter. Make no mistake: These organisms can and do make people seriously ill. They can prove fatal in isolated instances. Even the Centers for Disease Control (CDC) specifically recommends not consuming foods made from raw milk as a way to lower one’s risk of listeriosis. Given the possibility of bacterial contamination, why would anyone make or sell or eat raw milk cheeses? O.K., Americans are a bit paranoid about bacteria, but do you really want to risk serious illness for the sake of a cheese? Is it a question of economics, whereby raw milk cheeses sell for far more money? Are consumers of unpasteurized milk cheeses just engaging in risky behavior? Raw milk cheeses from Europe, were there are no restrictions. 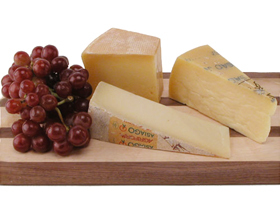 From top right: Abondance from France, Sao Jorge from the Azores and Asiago d’Allevo from Italy. Click here for more information or to purchase. By its nature, cheese contains bacteria. That’s how it’s made; it is, after all, milk with purposefully-introduced cultures (read: bacteria, albeit of non-harmful strains). Raw milk cheeses may have great flavor, but if they had proven blatantly and consistently hazardous over time, I doubt very much if anyone, even cheesemakers, would still be eating them. In other words, your chances of pathogenic contamination from any raw milk cheese are very low to begin with. There are a multitude of safeguards built in to raw milk cheesemaking. To begin with, any raw milk cheeses produced or sold in the US must be aged for a minimum of 60 days at a temperature of not less than 35°F; that applies to imported cheeses, as well. The logic here is that the two months of aging will allow the curd to dehydrate sufficiently, and become acidic enough, to make it difficult for harmful bacteria to multiply. Laws governing raw milk cheeses date from the end of the 1940s, however, and some of us think it’s long past time for a change. Raw milk cheesemakers are obsessive about the health of their animals and the care they take with their equipment, procedures, and products. They need to be. The FDA conducts both regularly-scheduled and surprise inspections of cheesemaking facilities, which may include testing of the finished cheeses. Individual states have their own regulations regarding pathogens in cheeses. Cheeses, unlike many other foods, are exposed for varying lengths of time to multiple environments, all of which might prove suitable for bacterial growth, so fanaticism in the many aspects of cheesemaking can be viewed simply as a means of survival. Procedural choices most people never think about (how often and for how long the milk is handled, strength of the salt brine if one is used, frequency of re-use, the temperature at which the brine is stored, etc.) are all determinants in whether a cheese is a pathogen-friendly environment. There are anaerobic bacteria out there, too, so even cheeses in plastic wrap or submerged in olive oil must be treated with care. Remember, these are small-scale operations; even one incident of pathogenic contamination could easily result in a lawsuit and/or the swift demise of the dairy. If you imagine that pasteurization of milk is a cure-all for contamination, think again. Pasteurization kills all bacteria, friendly as well as harmful. Some scientists and cheesemakers credit unpasteurized milk with having beneficial bacteria that can keep pathogens in check and not allow them to multiply. If the milk is pasteurized, they argue, it creates a blank slate; any bacteria introduced after pasteurization will have far less competition when they attempt to reproduce. Post-pasteurization contamination, especially by E.coli, is a not-unknown occurrence. Cheeses thus infected are referred to as “blown,” and will puff up or even break open as a result. Outbreaks of foodborne illnesses are tracked by the FDA (and other groups). The Center for Science in the Public Interest (CSPI) published a report that was updated and revised in December of 2006, charting these illnesses from 1990 to 2004. During that period of time, cheeses were responsible for 50 outbreaks of food borne illnesses, affecting almost 1800 people. (For all dairy products, including milk, cheese, and ice cream, but not eggs, the outbreaks during this time period totaled 168, with nearly 5600 Americans sickened.) That’s not reassuring, I know. However, during the same time period, seafood, produce, eggs and egg dishes, breads and baked goods, beverages, poultry, ground beef, other beef, pork, and lunch meats were all responsible for both a greater number of outbreaks and a greater number of illnesses than was cheese. This includes both raw milk and pasteurized milk cheeses. More remarkable still is the fact that unpasteurized foods accounted for 30% of the dairy illnesses, meaning that pasteurized dairy products accounted for 70%. In February 2007, the FDA advised consumers not to eat certain production runs of two brands of peanut butter, citing evidence that the peanut butter might be contaminated with Salmonella Tennessee. Two hundred ninety people from 39 states had become ill from this strain at the time the advisory was issued. In the fall of 2006, the same agency issued a statement urging people not to eat fresh spinach or products containing it; over 200 people in more than 20 states had been sickened by E. coli bacteria in fresh spinach. This outbreak resulted in more than 60 hospitalizations and at least three deaths. The centralization of large-scale food production and processing means it’s easier for pathogens to find their way into larger quantities of food, which will then be distributed to greater numbers of people. If it’s seemed to you that outbreaks of foodborne illnesses were more widespread and affecting more people in recent years, that’s part of the reason. 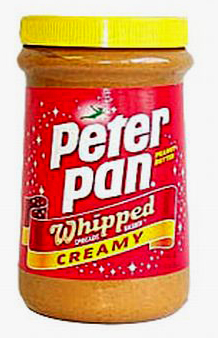 But if something as “sturdy” and non-perishable as peanut butter can be the agent of infection in foodborne illnesses, maybe we need to take a long, hard look at all of this centralization. I’m not a doctor, nor am I a scientist. However, I’m also not reckless. I love cheese, and I want to be able to have a choice in the type of cheese I eat. I’ve been eating raw milk cheeses for years now, and I’ll continue to do so, especially after seeing the CSPI report and understanding just how painstaking raw milk cheesemakers are with their animals and their products. iGourmet.com (and other websites) carry the fabulous Berkshire Blue, an American-made blue cheese I think is one of the best in the country. It’s made from whole, raw milk of Jersey cows and is not usually restricted to seasonal availability. There are great raw sheep’s milk cheeses from Valley Shepherd Creamery, including their Oldwick Shepherd, Tartuffo Shepherd (with bits of black truffle), and “Carameaway,” a raw, mixed-milk cheese with caraway seeds. 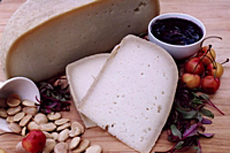 Try some cheeses from Sweet Grass Dairy; go for their excellent cow’s milk Thomasville Tomme or the Holly Springs raw milk goat (photo at right). For more seasonally-based cheeses, try LoveTree Farmstead Cheese in Wisconsin, where Mary and Dave Falk make Trade Lake Cedar, a wonderful, complex, raw sheep’s milk cheese, and a host of others. Bear in mind that some cheesemaking operations offer both raw milk and pasteurized milk products, so if you want raw milk cheeses, be sure to read about the cheeses before you order them. There’s also the website Fromages.com. I have not ordered from them, but I have heard good things about this business. 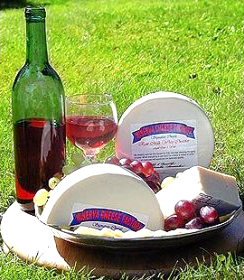 When you look at the descriptions of individual cheeses, you will not see the phrase “raw” or “unpasteurized” milk. But look to the right of your screen, where the cheese’s region of origin and the type of milk used to make it are noted. If you see the words “For U.S. 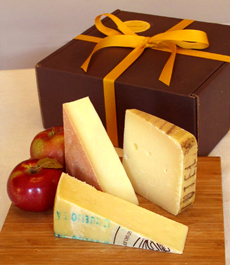 Delivery Maturing Extended Over 60 Days,” you’ll know this is a raw milk cheese. 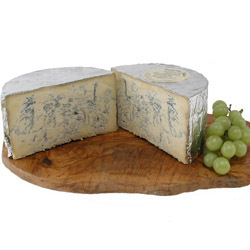 Berkshire Blue, available at fine cheese retailers. Click here for more information or to purchase.